to help celebrate equality, diversity and inclusion. At Google we believe that by creating an environment where everyone can feel comfortable bringing their whole selves to their work, they can be more innovative, creative, and inspired at work. We also want our employees to have the same inclusive experience outside of the office as they do at work, and for people to be safe and to be accepted wherever they are, so we look for impactful ways to help the LGBTQI community in Australia. This year we wanted to take an authentic approach that would promote equality, make a big and lasting impact, and give people a stronger voice, so we helped to fund the Mardi Gras Community Parade Grants program. This program is designed to provide grants to individuals, community groups and not-for-profit groups to help lift their parade entries to a completely new artistic level. Androgen Insensitivity Syndrome Support Group - AISSG is a peer support and advocacy group for people affected by AIS and/or related intersex variations, and their families. Their float hopes to raise the visibility of people with an intersex variation, and that show they are not ashamed, but happily maintaining their identity, their bodies, families and communities, and one another in wholesome support. Selamat Datang - Supporting LGBTQI Indonesians - Selamat Datang was created to show support for LGBTQI people in Indonesia and their struggle for acceptance in Indonesian society. Selamat Datang helps to fundraise for LGBTQI organisations in Indonesia including safe houses for young GLBTIQ people and fundraising for people living with HIV/Aids in Indonesia. People with Disability Australia - Founded in 1981, People with Disability Australia seeks to provide people with disability with a voice of our own. We have a cross-disability focus representing the interests of people with all kinds of disability. We are a non-profit, non-government organisation. With their float PWD want to highlight that Disability Pride and LGBTIAQ Pride are one in the same. Lifesavers with Pride - Lifesavers with Pride are an advocacy group within surf lifesaving. Our role is to be the link between the LGBTQ community and the lifesaving community. They represent their LGBTQ members, by promoting lifesaving as a diverse, welcoming and progressive organisation that supports people of all sexualities. Trans Sydney Pride - TSP is a Sydney based social and support group founded by binary transpeople for binary, non-binary and gender queer transpeople. Their vision for their Parade float is to provide visibility to the trans community and show that they are strong, diverse and beautiful. Northern Territory AIDS and Hepatitis Council and Departure Lounge with special guests the Tiwi Island SistaGALS - The Northern Territory AIDS and Hepatitis Council (NTAHC) and Departure Lounge presented 'Territory Stars', a showcase of the unique LGBTQI Community in the Northern Territory and their supporters. Special guests on this float included the Tiwi Island SistaGALS, a group of Trans women who started a crowdfunding campaign last year to attend their first ever Mardi Gras. Psychedelic Love - Is made up of a diverse group of friends, a mixture of LGBT and family and friends and supporters who wanted their float to celebrate their love for one another and for the community in which they live. Sydney Women’s AFL - With women's teams from across all states and territories, Sydney Women’s AFL is made up of a mixture of straight, gay, trans, Muslim, Catholic, Christian participants who all support each other for who they are. The group took to the streets to show that their is no place for discrimination in sport. There is no place for discrimination in life. The Gay and Lesbian Association of Doctors and Dentists - GLADD are an open LGBTQI friendly group of Doctors, Dentists, and allied healthcare workers - who organise a parade entry for Mardi Gras each year as well as other community events such as socials and wine tours throughout the year. Wett Ones Sydney Swim Team - The LGBTQI Masters Swimming Club walked the Parade to celebrate their diverse membership of different sexualities, genders, ages. They hoped to demonstrate that although their members come in all shapes and sizes they are united as a team and that everyone is given an equal playing field (or swimming pool). Inner City Legal Centre - ICLC has been providing free legal services for people in the inner city area for thirty-five years. The Centre provides a range of free legal services to people in the Sydney. Their float communicated the support of the community legal centre sector for LGBTQI justice and its continuing campaign for creating equality. DAYENU – Sydney’s Jewish GLBTI Group - Dayenu has been running for 16 years and had their first Mardi Gras float in 2000. Their message this year went out to the gay community to promote diversity and religious tolerance. Gay Tradies - This group is made up of gay trades and their friends and supporters. They hoped their float will highlight that there are LGBTQI people everywhere, including the trades and services industry. Oceania Rainbow - This group’s mission is to create safe spaces and support networks for young Pacific Islander LGBTIQ in Sydney. 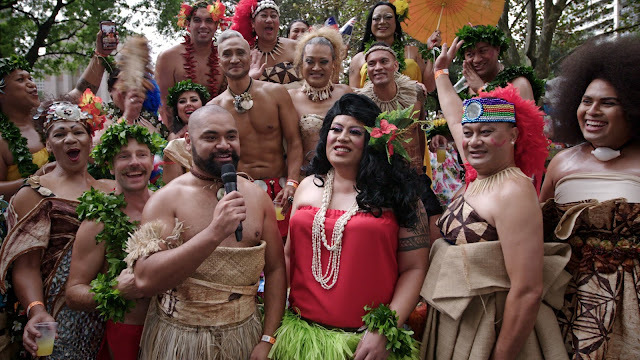 With their float they hoped to increase their visibility in the community as Pacific People who are proud of identities. Flourish Australia - Flourish Australia supports people on their mental health recovery journey and helps to reconnect with the community to live a contributing life. By participating in the Parade, they hoped to show their support to the community and deliver the message that everyone has the freedom to Flourish in their own way. Different Strokes Dragon Boat Club - Different Strokes is a Sydney-based dragon boat club that was formed in 2008, with the aim of providing a social and fitness-focused sporting outlet for the LGBTQ community. With their float design they want to show a future where creating equality is not a question, but a reality. 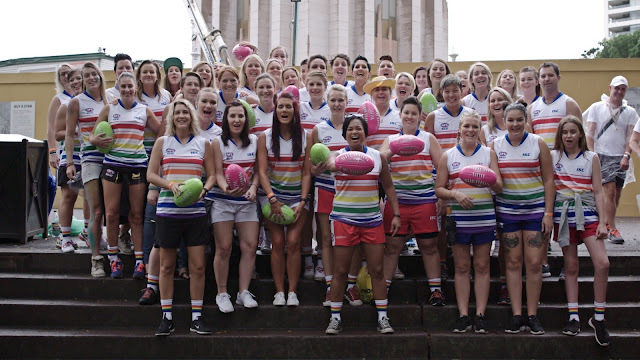 Words can't describe how breathtaking it is to witness the enormous diversity of groups that make Sydney Mardi Gras so special, and it was fabulous for everyone at Google to be able to make a difference to their participation this year. One of our favourite times of the year at Google is when we get together with our friends at the Sydney Gay and Lesbian Mardi Gras to help celebrate equality, diversity and inclusion.